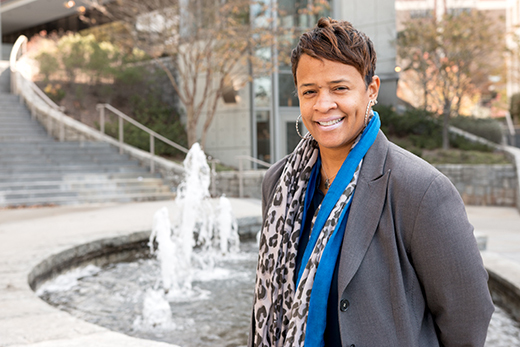 Adrienne Slaughter serves as director of Emory's new Office of Student Success Programs and Services, which offers a central resource for emotional support, academic assistance, financial emergencies, veterans' services and a range of scholarship programs. Photo by Matt Cone. Can a university serving almost 15,000 students on a campus spanning more than 600 acres provide a one-stop shop for resources that address issues ranging from emotional support to veterans' services, academic assistance, financial emergencies, and simply adapting to social life on campus? The answer is a confident "yes," according to Adrienne Slaughter, director of Campus Life's new Office of Student Success Programs and Services, which combines such resources under a single umbrella. In 2014, Emory Campus Life undertook a major organizational restructuring. The goals included consolidating student-facing services for optimal synergy and impact, and strengthening communication and collaboration among the division's scores of programs and services. Slaughter sees the creation of her office as a microcosm of the larger restructuring. "Student Success is here to help students succeed psychologically and emotionally, socially and financially, as well as academically," Slaughter says. "In all of these areas, we help students remove obstacles that we know have tended historically to impede student success." For the Office of Student Success, restructuring means managing a range of outreach initiatives that directly serve students, including the three-year-old Student Intervention Services (SIS) Team of 10 trained Campus Life staff members led by Slaughter. With rotating on-call assignments, a team member is always available 24/7 by phone or email to coordinate the University's response for students experiencing acute distress and to facilitate their access to resources and support. An extreme example of acute distress would be a student experiencing deep depression or thoughts of suicide. Students in such circumstances – or someone who is aware of the situation – should immediately contact the SIS Team. SIS also assists students with less urgent crises, including short-term financial emergencies, academic challenges, transportation needs, and other issues. For example, every year a number of students need help with housing. "We have had students whose only residence is Emory, so they have no place to go when campus is closed," Slaughter says. "And, at the same time, we have some international students who simply cannot return home during such periods in the school year." While the SIS Team serves students across Emory's remarkably diverse population, other Student Success initiatives are more targeted. The 1915 Scholars Program provides academic and social support for Emory's first-generation college students. Established in 2014-15, the program now serves more than 30 first-year and sophomore students. Slaughter has revamped the initiative to provide each scholar with a mentoring team that includes a student peer, Campus Life staff members across several disciplines, and an Emory University alumnus. Emory's 1915 Scholars also receive specialized orientation activities, academic workshops, community-building events and information sessions on available resources. Student Success plans to launch a newsletter to keep families of 1915 Scholars informed and identify ways they can support their students. "Many of our 1915 Scholars come from homes that are able to assist them in school in various ways; others do not," Slaughter says, explaining that first-generation students are at greater risk to leave school after their first year than are other students. "The Office of Student Success is committed to increasing the odds for them and all students at Emory." Slaughter also serves as a liaison with several other Emory scholarship programs. The Emory Advantage initiative assists students whose families have incomes of less than $100,000 and need financial aid. The program makes an Emory education affordable by reducing the amount of money a family must borrow to pay for their student's education. The Office of Student Success serves as Emory's liaison with a coalition of 36 colleges and universities that partner with QuestBridge, a national nonprofit organization that connects talented students from low-income backgrounds to four-year scholarship opportunities with member institutions. Slaughter's office also works closely with the Gates Millennium Scholarship Program, funded by the Bill & Melinda Gates Foundation. The program provides financial support to outstanding racial and ethnic minority students to help them complete their undergraduate degree programs in any field they choose. In addition, Student Success helps to deliver services for Emory students who are military veterans. Slaughter is planning a series of workshops for veterans and their families. The sessions will address topics such as coping with PTSD, transitioning back to civilian society, and coping with the demands of a college education. Slaughter emphasizes that Student Success initiatives all have the same ultimate goal – to foster students' self-discovery through academic and personal growth. "To do that, we help students learn to be responsible and accountable to themselves and others," she says, pointing out that the need is shared by students across the racial, ethnic, gender, cultural and class lines of our global society. "Our bottom line is that the Office of Student Success offers all Emory students a safe and welcoming space, access to resources, and judgment-free guidance and assistance," Slaughter says. "We meet our students where they are and assist them with the needs they have. It does not matter who they are or where they come from, their socioeconomic or other circumstances. We welcome all Emory students. In addition to her new role as director of Student Success, Slaughter continues to serve as a case manager with Campus Life's Student Health and Counseling Services. She is a licensed clinical social worker with more than 20 years of experience that includes rigorous clinical training and assignments as a behavior analyst, a psychotherapist, a clinical care manager and an instructor. Slaughter holds a master's in social work and a bachelor's in sociology. For more information on Campus Life's Office of Student Success Services and Programs, visit success.emory.edu.